December 2013: Tips eNews & More! 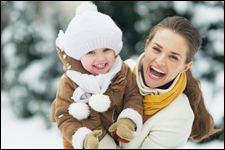 As this year comes to a close, and we eagerly anticipate what 2014 will bring, we would like to take this opportunity to say "Thank You" to you, our valued patients. 2013 was a great year for us, and we hope it was a great one for you too. And don't forget, your dental benefits may reset at the end of the year, so be sure to request a final appointment to avoid missing out on any benefits. Are you hesitant to show your teeth when you smile? Many people, for one reason or another, have lost a tooth. Reasons range from poor dental hygiene to any variety of accidents. Whatever the reason for the missing tooth we can repair your smile and replace your tooth with a dental implant. A dental implant is a small prosthetic post that is placed into the bone of the upper or lower jaw. The post functions as the root portion of a lost natural tooth and serves as an anchor for a replacement tooth. An artificial tooth is then attached to the post. Dental implants look and feel exactly like natural teeth - in fact, no one other than you and your dentist will be able to tell the difference. Click here to learn more about dental implants. Looking for a delicious treat to enjoy after your holiday feast? 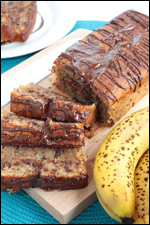 This recipe for Chocolate Banana Loaf is just what the dentist ordered! It's quick, relatively simple and super yummy! This recipe is flexible, you can use melted butter instead of coconut oil or blueberries instead of chocolate. Either way, it'll be delicious!